Battlefield 3 developer DICE says the cuts to the console versions of the game are the best compromises it could make in order to keep the experience intact. DICE had two choices when it came time to make Battlefield 3: "dumb down" the PC version to make it identical to the Xbox 360 and PS3 releases, or go all-out with the PC and then work to bring the consoles up to that level. It chose the latter and while that's obviously better for the game by any rational measure, it's also led to some predictable hand-wringing, certainly not discouraged by Activision, about a sub-standard console release. But DICE's Patrick Bach says that while console compromises were necessary, they were made with the sole purpose of keeping the experience intact. "Everything is a compromise. It's not that we're evil or stupid. We didn't choose not to have more players - we would love to do 64 players on console but then we would have to cut away so much; people would get very upset that it looked worse, played worse and wasn't as fun as the PC version," Bach told Gamezone [via CVG]. "We would never do that because the fun is always more important." "The biggest difference between the PC and console version of Battlefield 3 is that we have 64 players on PC and 24 players maximum on console. The rest is more or less the same: we use the same engine, the same technology, the same animation system, the same lighting system," he continued. "Our aim is to give the player the exact same experience and not try to dumb down the console version." Maps will be smaller as well, although Bach emphasized that the differences will be slight. "When we say they are smaller, it's not that we have cut them in half. But we tried to compact them slightly to keep the action up," he said. "If you compare it to Battlefield: Bad Company 2, the maps weren't really small on console. We actually had huge maps even for console. We have the same kind of angle on it right now [in Battlefield 3]. We want to create the same experience for PC as for consoles." 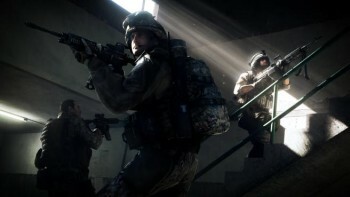 Battlefield 3 comes out on October 25 for the PC, Xbox 360 and PlayStation 3.